Stock up on baking soda! Baking soda is another one of those things, like vinegar, that has a ton of uses and can replace a lot of the more expensive products you already use. I buy it by the giant bag-full at one of the national warehouse superstore chains. A quick search of google or Pinterest (yes, I’m on Pinterest, and yes, it’s completely addictive. This is me.) 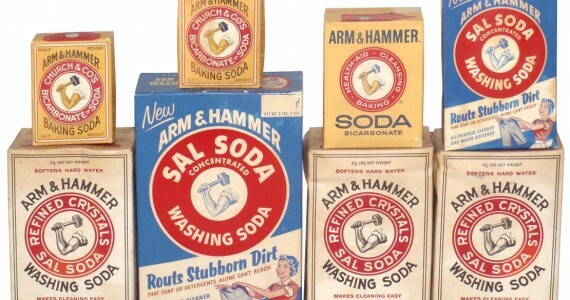 for “baking soda uses” will pull up so much information that you might not know where to start. Insect bits/stings: A couple of weeks ago, The Master of Disaster was stung by a carpenter bee. Five times. It flew up his sleeve and panicked when it couldn’t get away. Poor little guy. I made a paste of baking soda, apple cider vinegar that had been steeped in lavender (a couple drops of lavender oil works, too), and a few drops of tincture of nettles, and put a dab of that on each sting. The swelling went down very quickly. This also works on mosquito bites and other insect bits and stings. Oven cleaner: Start with about half a cup of baking soda, add a couple squirts of dish soap (I used Dawn), and slowly mix in enough vinegar to make a thin paste (it will fizz at first). Spread it on the inside of your oven (avoid the ceiling… if you miss any when wiping clean, it will flake every time you use the oven; try using plain vinegar on the ceiling) and let sit overnight. Wipe clean in the morning. If any elbow grease is required, it will be minimal. If you want to avoid even minimal scrubbing, spread some more on the stuck on spots and let sit for a few more hours. To clean your smooth cook top: Spray some of the vinegar kitchen cleaner on the cook top, sprinkle with baking soda (I keep some in a re-purposed spice shaker for cleaning) and let sit for about ten minutes. Then use a sponge to wipe clean. You may need a bit of elbow grease for this, too, but not as much as you will for those stinky cleaners they sell for these new-fangled cook tops. And it works at least as good as they do. Cleaning pots and pans: I don’t remember the last time I had to buy steel wool for pots and pans. I don’t use it anymore. When I cook bacon and get that greasy, stuck-on layer in the bottom of the pan, I sprinkle baking soda in the pan (using my re-purposed shaker) and let it sit for a bit. When I’m ready to clean it, it comes right out. I just rub it around with my fingertips (I wear gloves to clean) and it comes right out. Rinse with hot water, sprinkle a bit more baking soda, and clean with a sponge and a bit of dish soap just to get the last bit of greasy residue out. No elbow grease required. Replace those Magic Eraser Sponges: I just realized today that baking soda cleans at least as well, and as easily, as those Mr. Clean Magic Eraser Sponges, and you know exactly what it is that you’re using. Does anybody know what those Magic Erasers are made of? I’ve had spots on my living room wall (I suspect it was once inside a bug) that I couldn’t get off with the Magic Eraser sponge, but some baking soda on a regular dampened sponge did the trick. If it works on metal-rubbing marks (from the boys driving their toy cars on the walls) and those last vestiges of crayon color that the magic erasers won’t quite work on, I’ll be thrilled. I’ll be trying the baking soda in the tub, too. I may never buy another Magic Eraser again. Drain cleaner: Pour half a cup of baking soda into your drain, then pour a cup of vinegar. Wait 10 minutes, then pour hot water down the drain. Whenever I have to clean my coffeemaker (just run vinegar through it, then plain water) I use the hot vinegar to clean the drains. It does seem to work better hot. Fruit and veggy wash: A tablespoon of baking soda in a large bowl of cold water makes a great fruit and veggy wash. I sometimes add a couple of tablespoons of vinegar, but the baking soda works well on its own. Cat box deodorizer: I keep another re-purposed shaker of baking soda near the cat’s litter box. When it gets particularly stinky, I shake some on top. Jillee says it works wonders for cleaning those greasy stove hood filters. I love her blog, she always has some good ideas there. thanks for the link! ❤ i do have a post for deo's without baking soda 🙂 LOVE your blog!! Thank you! I’m kind of a newb to the whole blogging thing. 🙂 I’m also a world class procrastination champ, which is why I have so little posted. I’ve just had a chance to glance through your blog some more. Very cool! I think I could learn a lot there! I’ve been thinking of trying a home-made dry shampoo, (it would make any camping trip so much easier!) and I see you’ve got a post about it. Could you be more awesome? And I’m definitely going to give that deodorant a try.